WHAT??? No, I didn’t poach this photo! 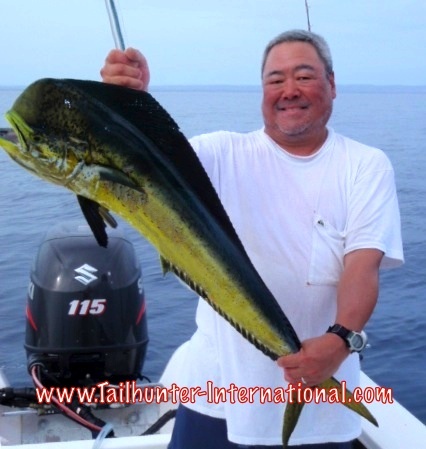 We actually got yellowtail this week at the Las Arenas lighthouse and Jorge Romero, our good amigo, rocked 3 of them fishing deep using dead mackerel with fish up to 30 pounds. In 20 years here, I have NEVER seen yellowtail here. These fish are cold water fish we find in March to May! Crazy El Nino! They’re finally getting a bit bigger! 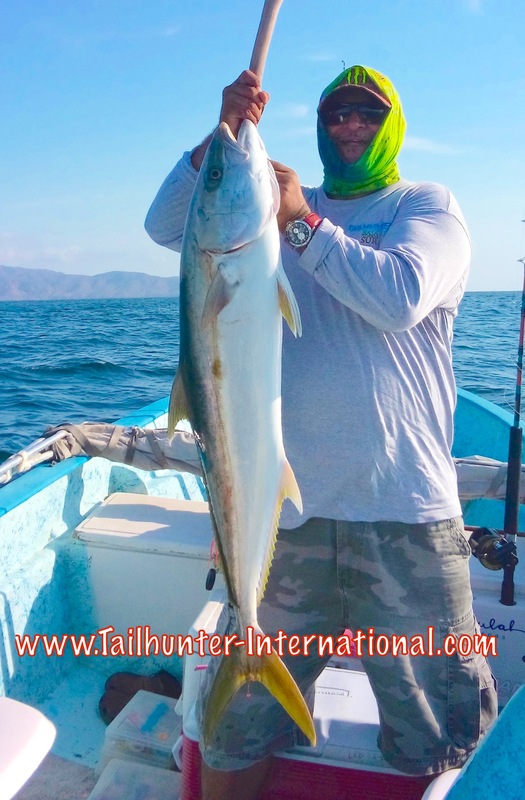 La Paz Bay and north towards Espirto Santo Island has been our “go-to” spot for dorado this season, but the fish have been smaller than normal. Finally getting some in the 15-25 pound category. 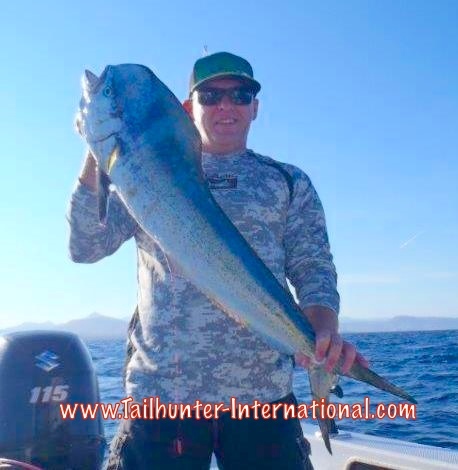 San Francisco amigo, Paul Nagata with another bull for the box. 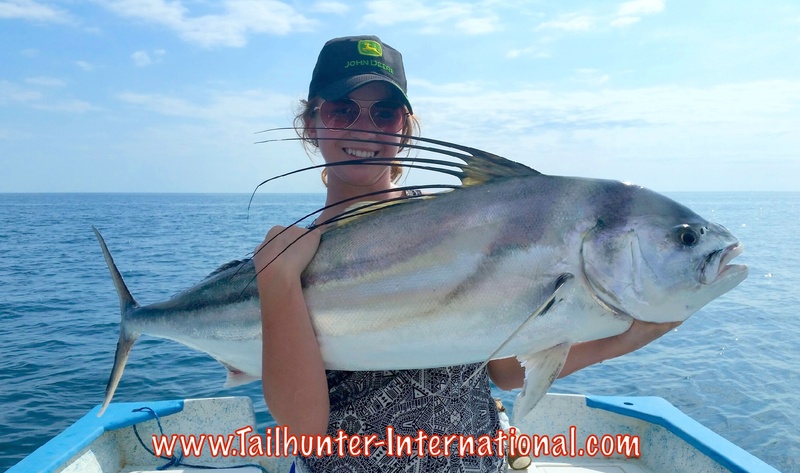 Before she heads back to college in Colorado, Taylor Marino and Captain Victor teamed up for some nice big roosters caught and released just off the beach near Muertos. All on bait. The kids are alright! The youngsters had some great stories to tell when they get back to school this week. Andrew Harvey has to be back in school next week for 8th grade, but he had a great time fishing all week getting in some great fishing including catching and releasing this big roosterfish. Andrew lives in Del Mar, CA. 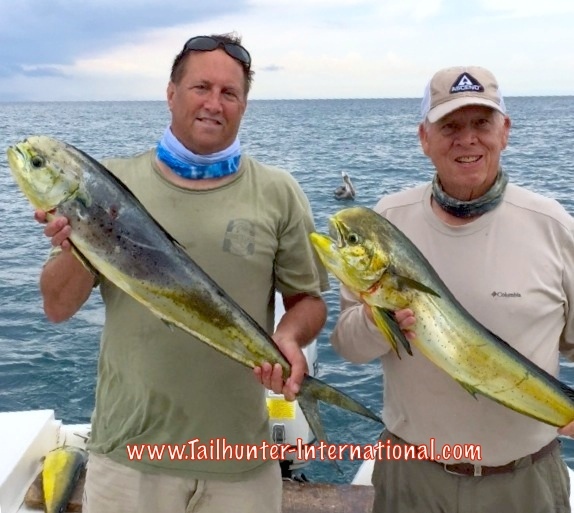 Long-time amigos of Tailhunter Michael Jordan from Santa Barbara and Steve Hartsook from Brentwood CA, hold a couple of their good fishing day for dorado as the rain approaches behind! It got a little wet for awhile! San Diego angler Scott Harvey brought the family down for the week and wanted to “hit the dorado hard.” He did pretty good with some of the larger dorado we’ve seen in awhile this season! Pretty colors here! Matches his shirt. She’s 15-years-old from Colorado and has a big smile to go along with the big rooster! Haley Marino got into the fish her dad and sister catching and releasing several big roosters. It’s hard to pose when a big dorado won’t cooperate and keep still! 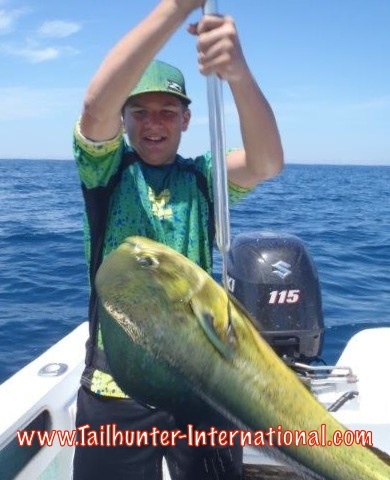 Andrew Harvey wanted to catch his first dorado and did that and more this week fishing with both of our Tailhunter La Paz and Tailhunter Las Arenas fleets. YELLOWTAIL IN AUGUST? ROOSTERS AND DORADO STILL CENTER STAGE! Summer dog days. Hot and humid with fishing action pretty consistent. Some quick summer showers. 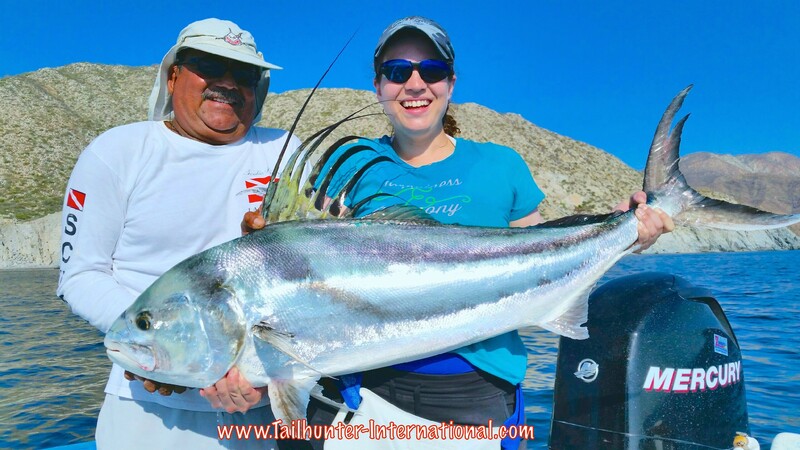 Just like in previous weeks, the rooster fish are the main attraction for the Las Arenas/ Bahia de los Muertos fishermen and dorado are keeping folks busy with our La Paz fleet. It’s sunny and hot with humid clouds and tropical conditions. Might be some thundershowers coming this week with a little storm out over the Pacific causing some momentary downpours, but not much wind showing. Good thing. Everyone going home with fish who wants fish! It’s still living up to it’s nickname as the “Roosterfish Capital of the World.” Our “smallest” roosters this week were 25-30 pound fish. The largest were in the 40-50 pound class. They’re not good to eat so everyone is releasing them, but sure are having fun with these big guys close to shore almost in the surf. The ticket is getting the big sabalo (lady fish) or liso (mullet)for bait. For other species, we had a surprise of yellowtail…yes yellowtail pop up! Yellowtail are cold water fish. We see them in the later winter and early spring. We haven’t had a yellowtail since May! The commercial guys and a few pangas hit the 25-pounders off the lighthouse late in the week. Crazy stuff. The trick was having mackerel and the fish are off the ledge holding in deeper colder water. And the mackerel were not easy to come by. But that’s been the trouble all season with the Las Arenas area. If bait were easy and around, we’d be catching all kinds of stuff in the area. As it is, all the bait has been around the La Paz area. A few dorado and cabrilla rounded things out. Oh…and we also hooked our first wahoo in awhile too! If you’re not catching a limit or near limit or double limit of dorado these past few weeks, something’s wrong. Many days our pangas are coming back early with tired anglers. In all honesty, the fish are much smaller than they have been in previous years, but there’s still good action. 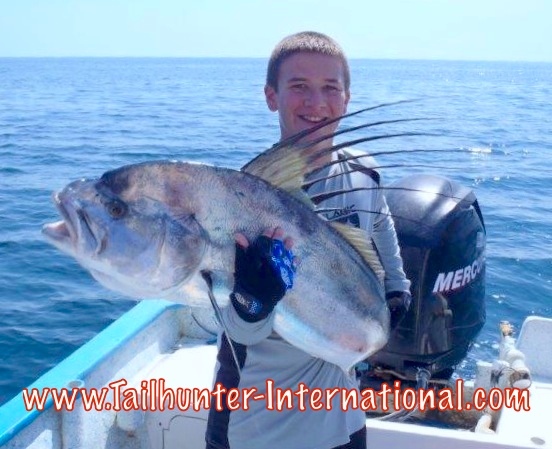 Even after limits guys are sometimes catching another 5-10 or more fish and releasing just for fun or going after other species like billfish or inshore pargo, cabrilla or rooster fish. The dorado have been dinky…admittedly…but this is the first week we’re seeing more 10-20 pounders or larger which is encouraging. So, the quality of the fish seems to be improving. It seems most of the summer we were stuck in the “nursery” of 5 pound fish! Anyway, there’s marlin and sailfish for those who want to give it a try and the majority of bites are right around the areas where the small dorado are hanging out since the billfish will eat the small dorado. There’s also some big schools of huge 20 pound jack crevalle that are tearing up the anglers plus big bonito. 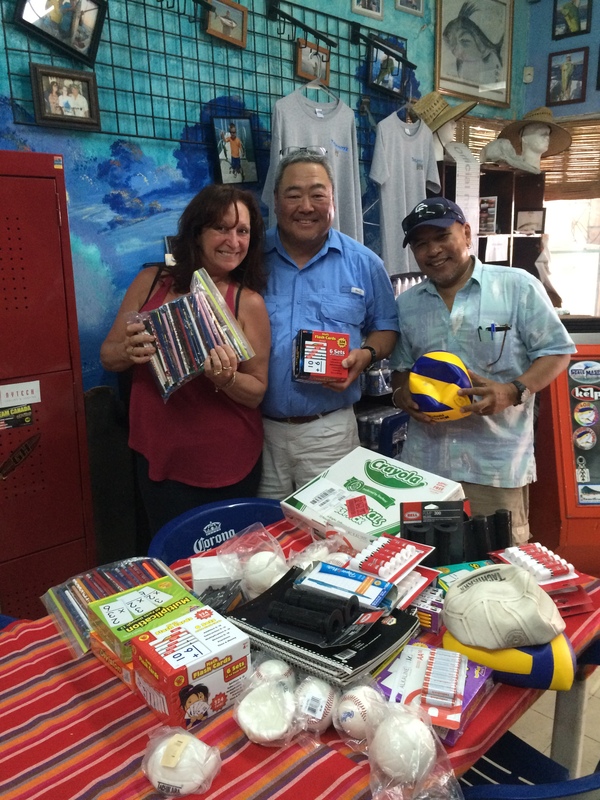 Our good friend, Paul Nagata, from San Francisco brought down two full coolers of stuff for our “Pack for a Purpose” program. Filled with sporting goods, balls, air pumps, crayons, flash cards, bags of pencils and other school supplies for the kids. Thanks, Paul!